cookware: a muffin pan… or two. 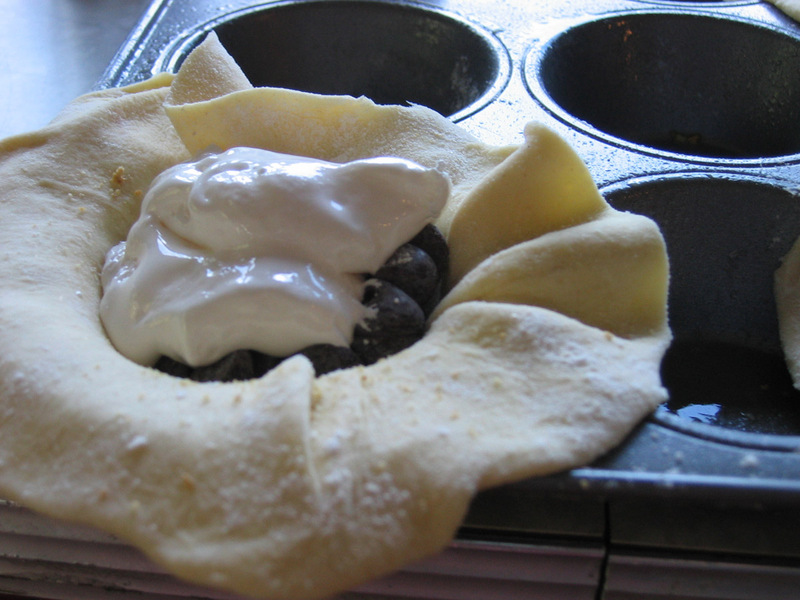 Combine two (2) crescent roll triangles into one ball, roll out into a flat floured area. 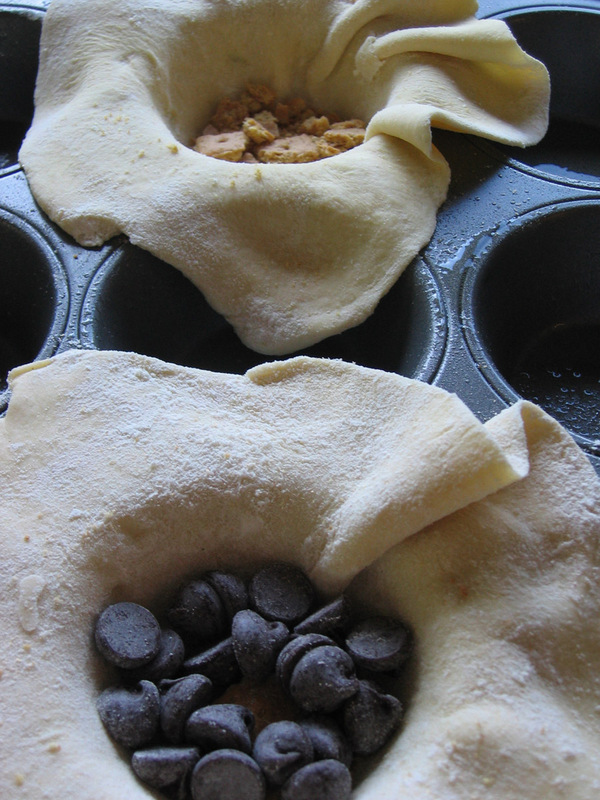 Place inside greased muffin pan (I made about 8 in each 12-slotted muffin pan). Add roughly 20 chocolate chips per pouch. Add 2-3 Tbl of marshmallow fluff per pouch and close up / twist them off at the top. Cook for 15-17 minutes or until brown (a little bit more than the crescent roll recipe to ensure cooking throughout). 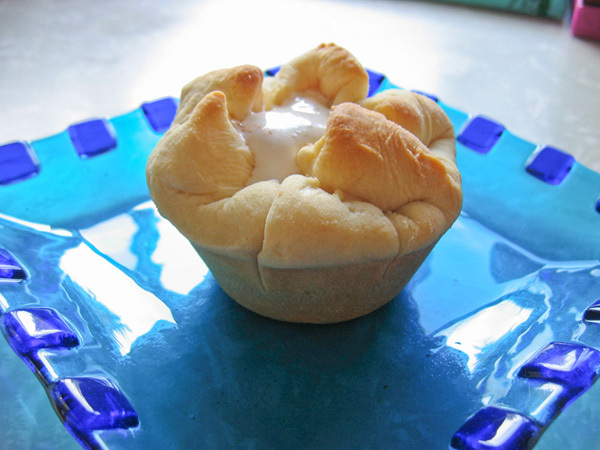 If you use puff pastry shells or phyllo dough, your cooking time and temperature will likely vary. The pouches tend to open up exposing the marshmallow. If you don’t want this to happen, figure something out for step 5… I didn’t mind them opening up a little bit. For a variation, if you have a crème brûlée torch, you could toast the marshmallow fluff a bit after cooking in the oven… yum! This is a mainly music-based blog. If you stumbled in on a recipe search, check out my other recipes, like vegan biscuits & gravy, spiced biscotti, vegan cactus chili, vegan bananas foster, mushroom dumpling stew, strawberry cornbread muffins, fruit spring rolls, and grilled coconut-rum pineapple at THIS LINK. Looks uber yummy. 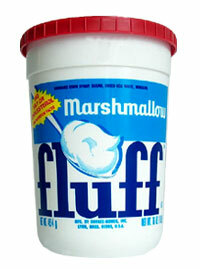 I love Marshmallow fluff. Wow! What a blog. You have a real knack for making a blog readable and easy on the eyes. I can’t wait to try out some of the recipes you have here (after a trip to the market to get the ingredients). Cooking is one of my favorite hobbies. I love improvising in the kitchen. I don’t have time to read all the recipes on your site right now, I found your site while I was looking for something else on Bing, but I’ve bookmarked your home page and will visit again soon to see the latest posts. Please bookmark my recipe web site at http://www.KAChef.com. Keep up the great work, and bon appetit! The blog was positively fantastic! Lots of great information and afflatus, both of which we all need!